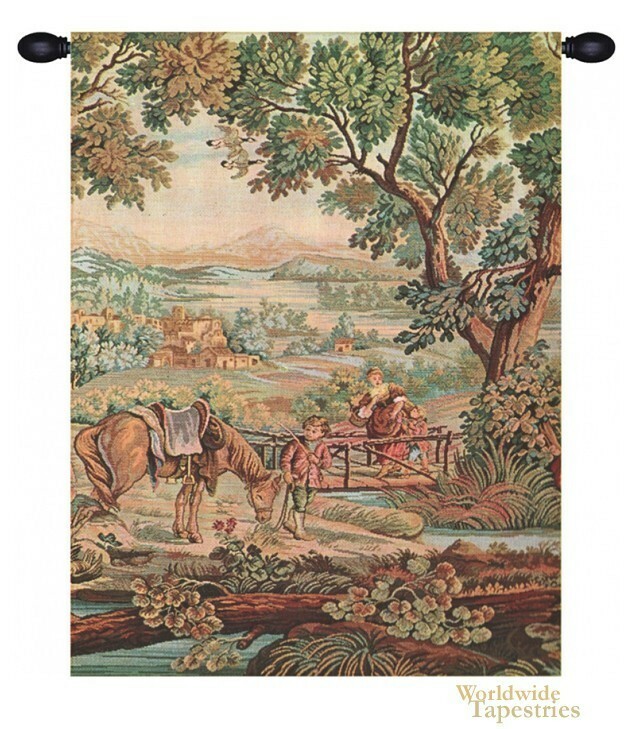 Ruscello tapestry shows a delightful country scene of life in the rural hills of Europe. Here we see a family of children and their mother with their horse by the river side. The homes of the village is in the background and beyond are the plains leading to the mountains in the horizon. This piece is in verdure style of the 17th century where the foliage is rendered in rich and stylized form. This Ruscello landscape tapestry is backed with a lining and a tunnel for easy hanging. Note: tapestry rods and tassels, where pictured, are not included in the price. Dimensions: W 16" x H 19"